High quality optical cable, toslink plugs have an attractive gold metal finish and gold plated inner pin. TOSLink cables are commonly used for connecting devices such as a DVD or Blu-Ray player and home cinema amplifier, also suitable for PS2, PS3, PS4, Xbox One, Sky HD etc. A high quality optical lead with a standard toslink connector on each end. 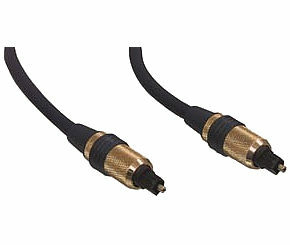 The toslink connector, originally developed by Toshiba has become the standard connector for optical digital optical audio connections. The connectors feature metal bodies and have a gold plated tip around the end of the fibre. A high quality round cable Scart Lead with metal bodied connectors and gold plated contacts. All 21 pins connected with individually screened OFC cable to provide the ultimate picture and sound quality. Ideal for interconnection of VCRs, satellite receivers, digi boxes & DVD players to televisions etc.